Bayswater and Paddington are a very popular area for budget class hotels. There are plenty of amenities in the surrounding areas with great shopping at Queensway. Close by is Notting Hill with a chic, upmarket and intimate feel. Park Lane in Mayfair is one of the most exclusive areas in London. 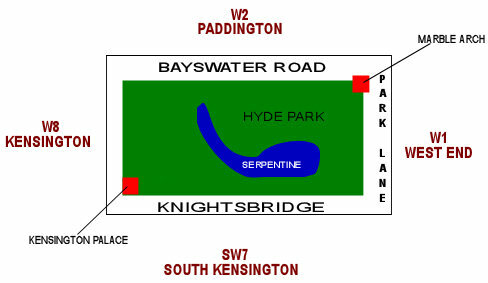 Hotels are mostly 4 and 5 star and Park Lane itself borders Hyde Park with many hotels having views over the the Park. Knightsbridge is another of the upmarket and trendy areas in London. Great shopping on Sloane Street and Knightsbridge itself. Close to Hyde Park. Shopping is good with busy areas at Queensway, Notting Hill, Marble Arch and Kensington. A traditional Victorian hotel built in 1907. All rooms are individually decorated and fully air-conditioned.